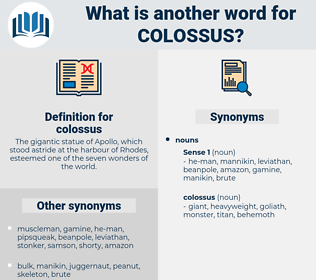 What is another word for colossus? The gigantic statue of Apollo, which stood astride at the harbour of Rhodes, esteemed one of the seven wonders of the world. midget, shrimp, runt, diminutive, dwarf, mite, wisp, peewee, weakling, whippersnapper, half-pint, lightweight, nonentity, wimp, twerp. Then the solid ground beneath him shook slightly, and an appalling crash of trees and underbrush to the rear told him that the stone colossus was on his trail. 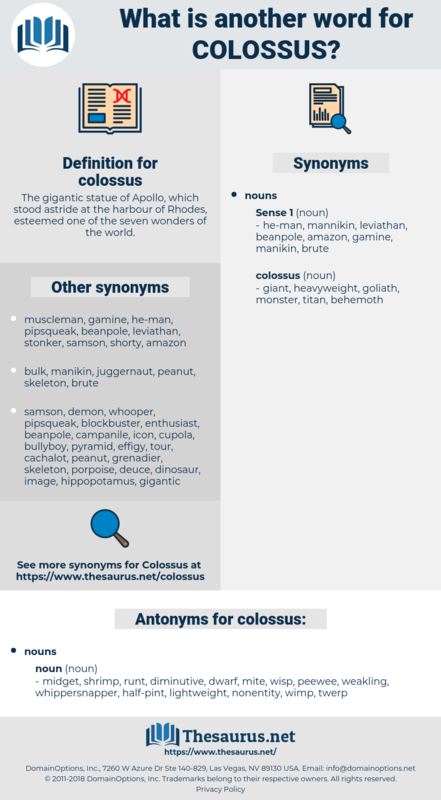 I walked among my fellows as if I were a colossus.